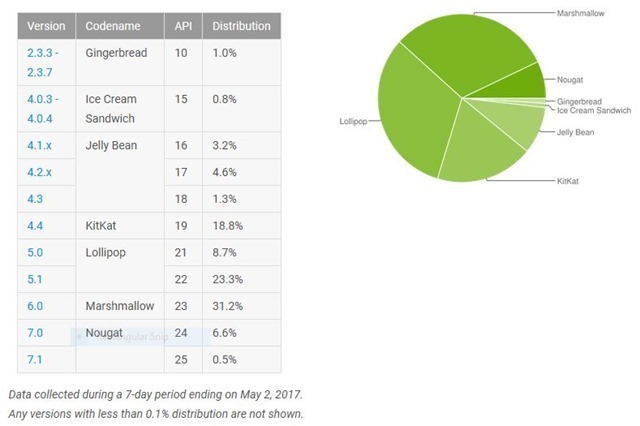 The Android Distribution Numbers for May 2017 have been published by Google, and the result is actually a mixed bag. Android 7.0 and 7.1 Nougat have risen to 7.1%, which is a 2.2% improvement from the 4.9% usage shares it held last month. The growth has actually fallen by 0.6%, as the latest operating system from Google showed signs of better adoption rate (2.8% in a month), in April. This is likely due to OEMs such as Xiaomi, which sell their latest Phones in large numbers, but with outdated Marshmallow based operating system on the devices. Clinging to top spot in the chart is Lollipop with 32% of shares, a number it held on to last month as well, as did Marshmallow with 31.2% in second place. KitKat dropped 1.2% of shares from 20.0% to 18.8% to take the 4th place, and Jelly Bean fell by 1% from 10.1% to 9.1% and is 5th on the list. The surprise of the lot however, is Gingerbread, which miraculously rose back to 1% after falling to 0.9% a month ago. Ice Cream Sandwich could not pull a similar stunt though and sits at bottom place with 0.8%, after another 0.1% drop in two months.